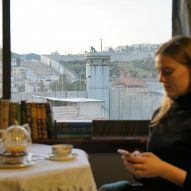 The artist Banksy has opened an "all-inclusive vandals resort" in Bethlehem, five metres from the wall that separates Israel from the Palestinian West Bank. 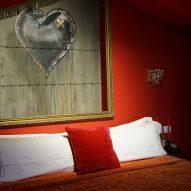 Banksy, who is known for his politically charged works, converted a former pottery workshop into the Walled Off Hotel, which includes a tea shop, art gallery and graffiti supplies store. It sits in the middle of stretch of the barrier that is heavily painted by Banksy as well as other artists. Banksy describes the facility as an "open-hearted community resource" that is not allied to any political party or pressure group. This idea is reaffirmed by its location in Area C, a section that – unlike many parts of the West Bank – is open to Israelis and Palestinians alike. Inside, the hotel has been decorated to resemble an English gentlemen's club, in reference to Britain's role in the region during the colonial period. 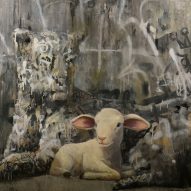 But hoping to bring the style "up to date", Banksy altered the opulent decorations to resemble images recently seen in the media. Oil-painted seascapes feature refugees' lifejackets, and statues appear to be choking on tear-gas fumes. "It's exactly one hundred years since Britain took control of Palestine and started rearranging the furniture – with chaotic results," said Banksy. "I don't know why, but it felt like a good time to reflect on what happens when the United Kingdom makes a huge political decision without fully comprehending the consequences." 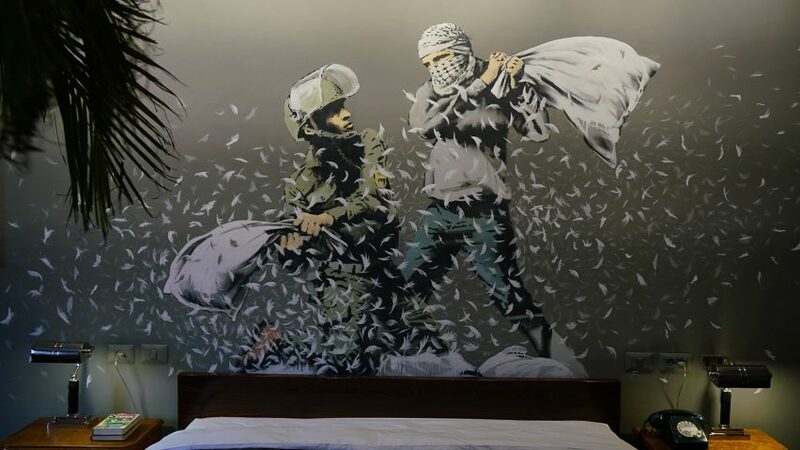 Banksy has decorated the majority of corridors and bedrooms within the hotel using a variety of his trademark stencils. However, some guest quarters will be decorated by visiting artists such as Sami Musa from Ramallah and French-Canadian Dominique Petrin. Rooms range from a presidential suite to a budget option, and while the higher-priced room is equipped with a hot tub and access to a roof garden, the small ones are filled with bunkbeds salvaged from an army barracks. An art gallery situated on the first floor will exclusively show work made in the region, with its curator Ismal Duddera saying it will "open an entirely new chapter of Arab art in general and Palestinian art in particular". 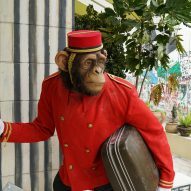 There is also a museum adjoining the hotel, which Banksy hopes will explain the wall to coach parties of tourists who pass it to get to Bethlehem's holy sites. In 2015, Banksy – who's identity remains unknown – opened his Dismaland attraction at a derelict lido in Somerset in August 2015. It was designed as a cynical take on the Disneyland entertainment resorts and attracted 150,000 visitors over a five-week period. 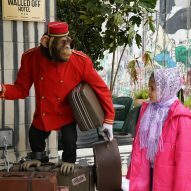 After closing his Dismaland "bemusement park", the artist sent wood and fixtures from the park's dismantled castle to the Jungle refugee camp, where he added a mural of Steve Jobs in his signature black polo neck, holding an early Apple computer in one hand while slinging a black sack over his shoulder.